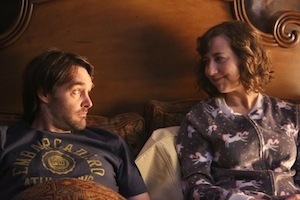 THE LAST MAN ON EARTH’s Phil and Carol certainly haven’t had a typical courtship and marriage, but the duo finally moved in together — thanks to Carol prompting the last cow on earth taking up residence in her home. But how will they fare? At WonderCon, creator/star Will Forte (Phil) and executive producers Chris Miller and Phil Lord were fairly coy…but pretty hilarious in their vagueness.